What Are The Outcomes of Hiring a Professional Piano Movers? 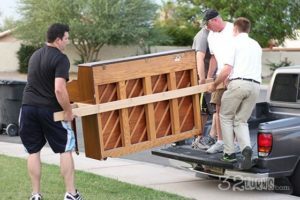 Home / Uncategorized / What Are The Outcomes of Hiring a Professional Piano Movers? Professional piano moving is very different from moving it by yourself because of its huge size and the money spent on buying and maintaining the piano. You must keep into consideration all the tasks involved in moving a piano outside your house and after that moving it to the desired location. In case you are thinking of saving some money and not hiring professional piano movers, you must reconsider all the facts and figures before making such a decision. Moving a piano by yourself can be a very difficult task for obvious reasons. It has a huge size and needs adequate equipment to move it even a single inch. Remember, you have to move it across some distance and this distance might be across a country, a state or a mile. A lot of precautions have to be taken no matter any of the above cases are prevalent. Proper safety measures need to be implemented because there is a lot of risk of damage that can be beyond repair to a certain extent. You definitely want to keep your piano as brand new without even a single scratch on it while moving. A layman would not have adequate equipment to move a piano outside his house and even if he manages to do that it is very difficult to move it across some distance where he wants to relocate. A person would have to put in a lot of effort if he wants to move the piano without any equipment. If you want the services of long-distance piano movers, you must contact them according to the previous customer reviews gone through. Following are the services of movers of a huge piano over some distance. They can move a piano with utmost safety irrespective of the distance to be covered. Taking proper measurements of the piano and the space it has to be taken out of must be very carefully done so as to have an idea about how much effort and equipment is required. Professional piano movers have to take adequate steps for the same. Having adequate equipment is the basic requirement from a professional and they have it all. There are some cases where heavy machinery is not required to lift the piano and move it. In case there is any damage done to the piano when moved by professionals, they provide you with insurance and bear all the cost of repair which is a very narrow chance of happening. This is to make your stress free and make sure that the services you are paying for are worth it. So, if you are wondering how to move a piano, you just have to contact a professional and invite them to your location so that they can take proper measurements and carry out the process professionally. You must choose the correct service for your situation by going through the modern piano moving service reviews. Previous customers will always be honest about the quality of services they have received and you can get an idea about the professionalism by successful services.